“I have very curly hair that can be difficult to style, and I booked Doranna over email having never met her, so at first I was a little nervous—but she turned out to be fabulous! I did a trial with her at her home in Playa a few days before the wedding. This made me feel more comfortable and gave us a chance to get to know each other. She did a great job on my hair and it looked very similar to the picture I sent her. She is also a really pleasant person so it was nice having her around all day while we were getting ready for the wedding. She was always on time, and always responded to emails. 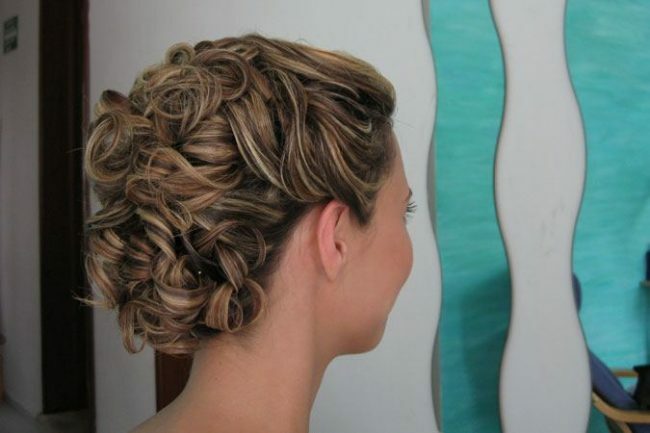 Initially we scheduled for her to do my hair and a few of my bridesmaid´s hair. On the day of the wedding more of my bridesmaids decided they wanted their hair done when they saw what a great job she was doing and she found time to do everyone’s hair. It was really windy on our wedding day but not a hair blew out of place after she styled it. I don’t know how she did it! It was still in place the next morning. I got so many compliments on my hair! Even my hairdresser at home was impressed when looking at the pictures.